The stories of Catholic monks subsisting on beer during difficult Lenten fasts may seem fanciful, but a homebrewer who tried a water and beer-only diet for 46 days touted its many benefits, most of which stemmed less from the beer and more from the practice of self-denial. Despite the regular alcohol consumption and the calorie-rich beer, he lost weight and gained clarity of mind. Having fasted myself in a variety of ways, I can personally attest that there is a significant improvement in the clarity of mind when we fast from those things that normally cloud our minds with seeking the next pleasure or worrying about the next pain. There are other benefits to the beer as well, one of which is that for those who do not have ready access to clean water, the process of brewing cleans the water and provides a beverage that is safe to drink. This came in handy when the plague came around and many lives were saved (under the direction of St. Arnold of Soissons), as clean water always does. Along with St. Amand and St. Arnulf of Metz, St. Arnold is the patron saint of brewers. I did not develop a strong enthusiasm for beer until fairly recently, perhaps because of a general reticence about alcohol from a Protestant upbringing and a very sober family. But now, I am very willing to drink the beer of fasts and deny myself many other things which I realize are more profoundly separating me from God. 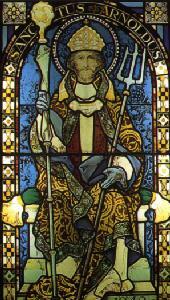 Note: The picture above is a depiction of Arnold of Soissons, patron saint of brewers, in stained glass. I have a drive to go above and beyond the call of duty. I work when I really shouldn't, and I've done so for years. I work out far more strenuously than the maintenance of my health obliges me to. I go to church, both my own and others, far more often than I am required. I engage in intellectual pursuits and writing to such an extent that people often compare me to academics. I pay more in taxes than is strictly required. I have been told that my generosity to those who have small wages is excessive. But I didn't always act in this way. Ten years ago, I was not so generous and far more selfish. My intellectual pursuits were mediocre by comparison to what they are now. My exercise regimen was sloppy and inconsistent. My church attendance met my Sunday obligation and nothing more. My personal prayer was minimal, whereas now it fills my day. My work ethic was merely adequate. So what changed? I did. I decided that it was not enough to survive in the mediocrity of a life spent seeking comfort. I began to pour myself into physical growth, intellectual growth, and spiritual growth; the return on my investment has been beyond anything I could have imagined while content with a life in the ruts of mere existence. I am far from the person I was ten years ago or even five years ago because of my choice to become an ascetic and a mystic, my choice to dive into the deep waters and make my way to Christ through the storm. It all started when I made a habit of going beyond what was asked of me, far beyond what was expected by society. This act of going beyond what is asked is called supererogation. The prototypical example is from the teaching of Christ that if we are conscripted to travel a mile, then we should travel another mile with him who conscripted us. This supererogatory dimension to Christian morality is what kept me from becoming a Buddhist, though there are certainly many good things about Buddhism. The wonderful thing about going far above and beyond what is required is that it is deeply transformative in a way that nothing else is; it reshapes us into a new creation. We cannot remain as we are if we venture far beyond what is expected of us, far beyond what we believe that we are capable of accomplishing with our lives. It is the supererogatory spirituality, that soaring upon the wings of love, which carries us far beyond what the small love within our heart can accomplish and unites us ever more with the bottomless well of divine love. It is only by diving into the deep ocean of love that we learn to swim in the depths of love. It is only by entering the depths before we are ready that we can become ready to enter the depths of the sufferings of others with the love and compassion necessary to draw them into the depths of love. It is only by turning to Love Himself, Christ who loved us unto death, that we can love to death our reliance on the air of pleasure and breathe ever more of the waters of love. A mandatory spirituality will keep us afloat when our emotions are not inclining us to love, an arbitrary spirituality will push us a bit beyond what we can currently accomplish by the strength of our love, and a supererogatory spirituality calls us completely out of our comfort zone and into the depths of love where we feel completely at a loss. And it is in that loss of our comforts that we are free to gain yet more of love's infinite bounty. This is the benefit of supererogatory spirituality. Nirvana is the telos of the Buddhist life; it is the quenching of the fires which will consume us from the inside, the fires of passion, aversion, and ignorance. Meditation is the mindfulness that, as the Buddha teaches us, follows after our moral discipline and with it helps us to quench those fires. This quenching of the fires is what ultimately allows us to escape the cosmos of suffering, achieving the final liberation from the fetters of death and rebirth. One of the goals of meditation is the cultivation of the mind of equanimity, the mind which does not destroy loving-kindness by clinging to its own suffering, but rather relinquishes the clinging to suffering to which we humans are so prone. In his discourses, specifically the Kakacupama Sutta, the Buddha offers us a technique to help us cultivate this mind of equanimity. 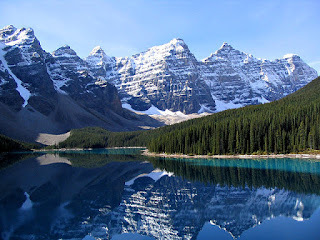 "Monks, there are these five courses of speech that others may use when they address you: their speech may be timely or untimely, true or untrue, gentle or harsh, connected with good or with harm, spoken with a mind of loving-kindness or in a mood of hate. When others address you, their speech may be timely or untimely; when others address you, their speech may be true or untrue; when others address you, their speech may be gentle or harsh; when others address you, their speech may be connected with good or with harm; when others address you, their speech may be spoken with a mind of loving-kindness or in a mood of hate. Herein, monks, you should train thus: 'Our minds will remain unaffected, and we shall utter no bitter words; we shall abide compassionate for their welfare, with a mind of loving-kindness, never in a mood of hate. We shall abide pervading that person with a mind imbued with loving-kindness, and starting with that person, we shall abide pervading the all-encompassing world with a mind imbued with loving-kindness, abundant, exalted, immeasurable, without hostility, and without ill will.' That is how you should train, monks..."
The beginning of the technique is to state and reiterate to ourselves the goal of equanimity in the face of suffering. We often struggle to cultivate the mind of equanimity in moments when others speak harshly to us or spread lies about us; these things are difficult enough to overcome. But life is full of far more difficult trials, and the Buddha knows that we need more than mere positive self-talk to help us through them, no matter how eloquent and accurate it might be. "Monks, even if bandits were to sever you savagely limb by limb with a two-handled saw, he who gave rise to a mind of hate toward them would not be carrying out my teaching. Herein, monks, you should train thus: 'Our minds will remain unaffected, and we shall utter no bitter words; we shall abide compassionate for their welfare, with a mind of loving-kindness, never in a mood of hate. We shall abide pervading them with a mind imbued with loving-kindness; and starting with them, we shall abide pervading the all-encompassing world with a mind imbued with loving-kindness, abundant, exalted, immeasurable, without hostility, and without ill will.' That is how you should train, monks. Monks, if you keep this advice on the simile of the saw constantly in mind, do you see any course of speech, trivial or gross, that you could not endure?" --"No, venerable sir." --"Therefore, monks, you should keep this advice on the simile of the saw constantly in mind. That will lead to your welfare and happiness for a long time." The Buddha calls us to an incredibly high standard, requiring us to abstain from hate in the midst of even the most vile tortures, to be interested only in the welfare of even those who hate us and kill us, to give only loving-kindness to those who have a complete lack of it. 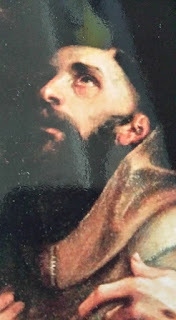 He invites us to enter into the most profound suffering with a heart of compassion, to experience the sort of torments we might undergo in the most torturous naraka after a deeply unfortunate rebirth without clinging to the suffering we endure in those moments and without allowing that suffering to shape our consciousness so that it passes our suffering onto others through our behaviors. The Buddha proposes that we hold in our minds at all times the tortures of a hell dimension as an antidote to the poisons of the passion, aversion, and ignorance which might otherwise make our consciousness sick with the pangs of the sufferings we will not relinquish. The Buddha recognizes that to extinguish suffering, we will have to embrace it fully with a mind of compassion rather than avoiding suffering as we so often do. The Buddha shows us that in order to dwell in nirvana, we have to first endure the torments of a naraka. He teaches us that the way to nirvana inevitably leads through a naraka, that what is better than the highest heavenly plane with all its delights is the moment of our experience of a naraka in which we abandon our clinging to suffering. This moment is the naraka of nirvana which we prepare for by meditating as the Buddha has instructed us. 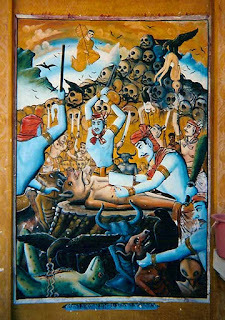 Note: Above is a picture of a mural depicting a hell dimension (naraka) in the Buddhist cosmology. Fair Questions: How do people become atheists? There are a variety of stories I've heard and read about how people became atheists. One I've mentioned before is Penn Jillette's story of how reading the Bible prompted him to become an atheist (which I call a case of Biblical atheism). Richard Dawkins, if I recall correctly, claims to have intuitively come to the conclusion that no gods exist while fairly young rather than having undergone a deprogramming or deconversion experience. Mark Bauerlein, on the other hand, had a sudden realization that convinced him that there was no god at all, that such supernatural and transcendent notions were utter fiction. A sudden realization that carried with him for 3 decades of his life. Holly Ordway never had a sudden realization, but rather gradually came to be an agnostic as a child and then an atheist after an irreligious upbringing. What's interesting is that in none of these cases did any of these people become atheists because they were mad at God. While it is a fairly common thing (at least in the U.S.) for a certain subset of zealous Christians to believe that atheists are all mad at God, it's simply not the case that all atheists reject the concept of God because they have built-up repressed anger from childhood because of a tragedy. And the angry atheist is going to be less and less common as more and more children are raised by atheist parents who don't set them up for disappointment by telling them, "God will never let anything bad happen to you." So the trite trope of the angry atheist professor in the film God's Not Dead is understandably appealing to those who think of atheism as just a childish emotional response, but it doesn't have the virtue of being straightforwardly true. Which is not to say that there aren't people who reject God because of tragic circumstances about which they are angry. One young man I encountered stopped believing in God fairly young after his dear friend died of cancer, and he was quite obviously angry about it. He believed firmly that a loving God would not let young people suffer and die, and that any God not loving in the sense he meant it was a bad God and not worth worshiping or trying to have any kind of relationship with. He was wrestling with the Problem of Love, as most of us do at some point. Sometimes we call it the Problem of Evil, but on a personal level, it's the Problem of Love, because we no longer believe that God could love us and allow such suffering to befall us. And this is something we should not at all be aghast at when we encounter it in our atheist friends and family members. Christians of all people should be wrestling with the Problem of Love. We have been shown by the death of Christ on the cross that Love Himself suffers and dies, that God sent His only begotten Son to die for the sake of love. The Christian who has not yet asked, "My God, my God, why have you abandoned me?" as Jesus did will almost certainly ask it once before they die themselves. No Christian who has read the Gospels should look down upon the atheist who is wounded deeply by death and suffering and the sins of believers, believing that God has abandoned them. Of all people, the People of the Cross should be compassionate with those who cry out that God is missing from the circumstances of their lives. And of all people, the People of the Cross who often fail to live up to the commandments of the one who loved us unto death should know that in each moment when we do not show people the love of Christ in the midst of suffering, the less believable the love of Christ becomes for those who witness our lives. If we abandon them because of their atheism, then are we not demonstrating once more that love fails in the midst of struggle and suffering, that there is no resurrection of love? If we as Christians would seek to understand why people become atheists, we should look at our own lack of sincerity about our religion, our own doubts and anger, our own struggles to understand the connection between love and suffering, and our own actions which fail to show people that love and suffering are inextricably bound up with one another. An old poem of mine that seems appropriate for the season of Spring showers and Spring flowers. marching on gentle air to the morning glory. a soft reminder of why the old willow cries. filling me with sadness at my maker’s lament. a grieving of love for a world of hate and fear. letting peace dance across the morning glory. a new start for the spring of cheer and mirth. reigning on gentle air from the one we trust. a washing away of soil that clogs our soul. 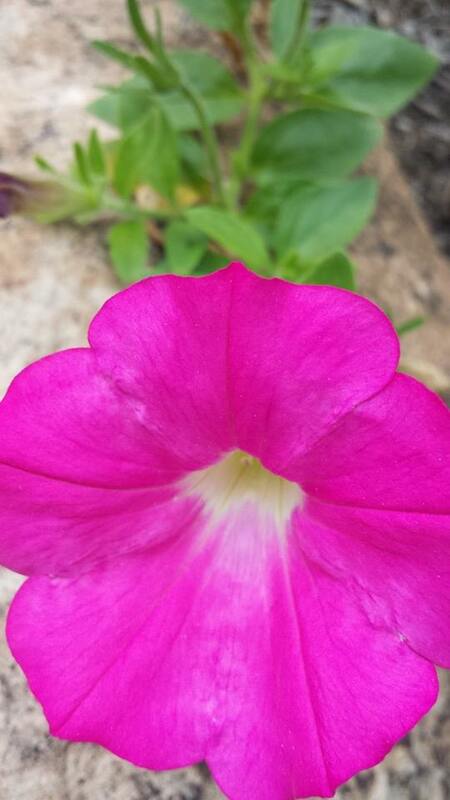 opening me to the petals of morning glory. Note: Photo credit goes to me. Over 15 years ago, I formally entered into full communion with the Catholic Church. That's probably an odd phrase to those who don't think of ecclesiology as a matter of full or partial communion, but rather in terms of self-identified membership in the congregations of various denominations. 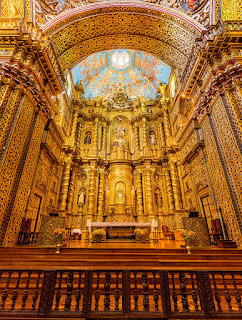 Before I was a Catholic, my ecclesiology wasn't well-defined either way, in part because I was young and in part because post-Reformation ecclesiology is rarely well-defined these days. Setting aside the issue of pre-Reformation and post-Reformation ecclesiological differences, let's get back to the matter of entering into full communion. Full communion isn't merely institutional or canonical; full communion is intrinsically personal. 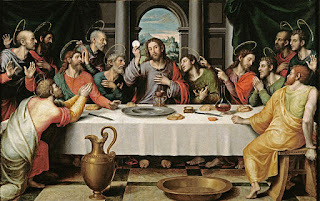 Full communion is the Communion of Saints, the communion of the person with her Creator, and the communion of Christ with His brothers and sisters in the Eucharistic feast. Far from being impersonal, full communion is as fully personal as one can get. And we know this from our personal relationships with others. When a person begins to develop a relationship with another person, and this relationship has sufficient benefit for her that she wishes to enter more fully into that relationship and establish a full communion of persons, then she is loathe to settle for a partial communion of persons. 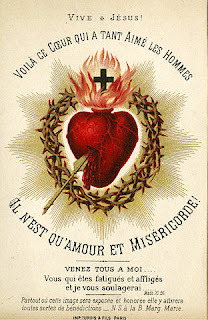 She who truly seeks full communion will not accept the partial communion of a lover's mere physical presence and physical satisfaction; she will not settle for a communion that excludes the depths of his heart and the breadth of his intellect. She will not accept the partial communion of a lover's mere intellectual engagement, bereft of his heart's fire and his body's warmth. She will not accept the partial communion of a lover's heart poured out for her to hold while he holds back from her the deepest yearning for love which is in his heart and the most passionate yearning for the most intimate closeness of his body. She will not be excluded from his brightest dreams and his darkest fears, from his greatest joys and his most heart-wrenching tears, or from his finest accomplishments and his most tragic failures. All that he is, the fullness of his existence, is what she will accept. No less than everything that comprises him is what she seeks; she will not rest until the body, the intellect, the heart, and the will which flow from his very soul are resting in her. The lover wants her beloved to know her mind, to fill her heart with love by every word spoken to her, to hold her and lift her up with his arms, and to be her soul mate as she walks on the journey of this life toward the heavens. There is no corner or crevice of his life into which she will not go who is seeking full communion, no secret of which she will not partake for the sake of suffusing his life with her love. She loves him all the more because he has given her all that he is. She does this not because she is selfish, but because she wants to give him all that she is as well, growing in love with him always through the process of a lifetime of radically mutual self-gift. This full communion of persons sought with such passion and devotion by the love-struck suitor is also what the Church seeks with all of those who were made in the image and likeness of Love; she would have every icon of love enter into full communion with Her. She is not afraid to enter into the darkest corners and crevices of our lives, not unwilling to share in the secrets of which we are most ashamed, loving us all the more because we are giving all that we are to Her. She will not spurn us who have spurned Her and may spurn her yet again, turning away from full communion with the Church because it is too difficult to let Her cut the cords that bind us to the ego which ever draws us away from entering into the full communion of Love. She will always stand with arms wide open, inviting us into the fullness of love which is a lifetime of radical self-gift to Her and to Him who established Her upon the Rock of Love. She will always invite us to share all that we are with Her, to grow in love so as to be in full communion with the Church and all Her members. 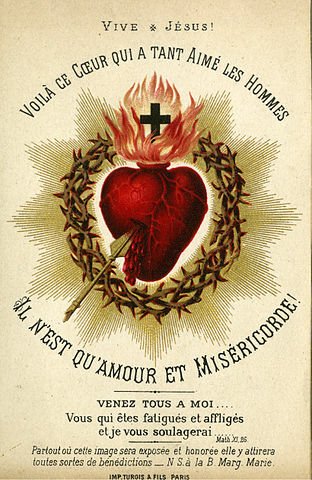 To enter into full communion with the Church is to align the intellect with Her teachings, to pray with the heart of the Church, to serve Her with the virtuous acts of the body, to will that She be made holy by Christ Her Bridegroom, and to bring one's soul ever closer in unity with the Soul of Christ, He who loved the Church into being. To enter into full communion with the Church is to give all that we are to He who gave us all that we are and all that He is for the sake of love. To enter into full communion with the Church is to receive the Body of the Lamb who was slain for us and the Blood of the Lamb which covers us so that death will not take us from Him. To enter into full communion with the Church is to love to death all that separates us from receiving the Precious Body and Precious Blood of Love Himself, the one who loved us unto death. The Holy Communion of Love which we are told by Love Himself we must eat and drink so that we might have life to the fullest is the fruit of the vine of Love, the ultimate expression of the full communion of Love. I didn't want to go to work this week. Or last week. I've been bouncing between ear infections and sinus infections on and off for the past couple of months. It turns out that even with a healthy diet and regular exercise, sleep deprivation and rapidly changing temperatures in an apartment overnight aren't good for one's health. Of course, I should want to go to work at all times. My desire to serve my co-workers in a spirit of love would ideally be so strong that it dissipates all my illness and puts a smile on my face all day. Maybe one day I will reach that point, but I'm not there yet. Sometimes my negative emotions and physical ailments are weighty enough that they throw me out of balance, tilting the scales of my heart away from love. But even when I don't have the right attitude, I go anyway because it is mandatory. And this is something I'm glad for; even when my heart isn't in it, the requirement to do my job and serve others is still in it. The fact that going to work is mandatory is a very good thing. It pushes us to do something good even when we might otherwise have a cold and hard heart which wants to bar itself up and keep away from anyone who might need our help. The requirement to go and serve others, because I weight it so heavily, helps to tip the scales back to the side of love. Some might think that this is not actually love or is a very weak love, but our love is not strongest when we have warm and fuzzy feelings for others and act accordingly; our love is strongest when we have cold and hard feelings for them and act lovingly in spite of those feelings. The choice to act lovingly even when we don't want to is a far stronger form of love than the kind of love which is buoyed up by the balloon of temporary emotional highs. The air of warm and fuzzy feelings can easily be taken out of the balloon, but the love of obedience to the mandatory requirements which demand service to others remains solid no matter how little air remains heated by our warmest and fuzziest feelings. Even a small act of love which is performed while struggling against the walls of indifference, hate, or despair in our hearts is greater than the most magnificent display of love which comes so effortlessly while supported by a transient euphoria. This same principle applies in our spiritual practice as well. There will be times when we struggle to pray, when we struggle to give generously of our treasures, and when we struggle to abstain from those things which are proscribed for the good of our spiritual health. We will struggle against the walls of indifference, hate, and despair which weight the scales of our hearts away from love. Fortunately, the mandatory spiritual disciplines of the Church are there to help me push my ego out of the way and perform acts of love regardless of my feelings in any given moment. The immense weight of the requirements of the Church are there to tilt the scales of my heart inexorably back in the direction of love, turning me toward the one who loved us unto death even when my heart is cold and hard so that Love can fill it with warmth and light again. Her mandatory prayers, sacraments, tithes, and fasts fill the scales of my heart so much that even in those moments when my intellect cannot provide a reason to love, when my body has not much strength left for acts of love, and my will is weakened so much that I do not even will the good of another, the scales of my heart are nonetheless tilted toward the side of love. That is the benefit of mandatory spirituality. in his hour of death, yet suffering before seeing Your Kingdom. Your commandments because of their love for God's Holy One. Precious Blood poured out for us from Thy glorious wounds. 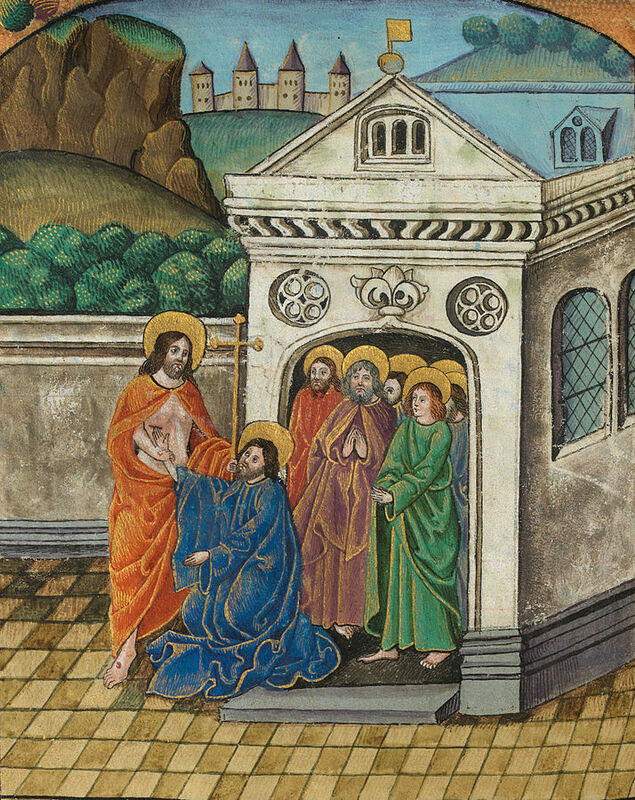 Note: This is called the Incredulity of Thomas, and it shows Thomas placing his hand in Christ's side, as do many of the works of art based on the events described in the New Testament. 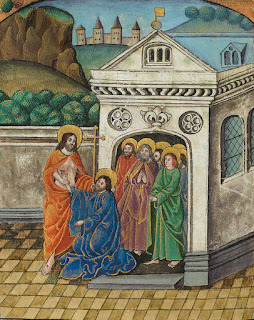 The portion of the Gospel of John in which this event is related is the source of the phrase "doubting Thomas" in common parlance. You can listen to the embedded podcast version of the 3-part series or read the written version below. I like to win. I like to be excellent at whatever tasks I set out to learn and accomplish. In short, I seek victory. When I was younger, I didn't understand victory. This was a problem that became apparent to me as I was training in martial arts. As someone who watched action films, cartoons, and other television shows featuring characters who were victorious martial artists, I had seen victory accomplished many times. Some victories were won through the superior speed of a character's punches and kicks. Others were won through superior strength behind the wielding of a weapon, or superior aim with a ranged weapon, or superior agility, or clever subterfuge. What I was learning is that victory is a matter of the most effective destruction of one's opponent, a matter of winning the fight by virtue of superior technique, speed, strength, agility, or intelligence. So when my instructor told me that true victory for a martial artist is avoiding a fight, preventing a fight from happening, or talking one's way out of a fight...well, I was being confronted with an entirely different way of understanding victory. I was learning that combat, which I was expending a great deal of time and effort to learn, was not a sign of victory. Instead, it was a sign that I had handled the situation so poorly that I had been forced to fight or a sign that I had controlled myself so poorly that I wanted to fight. But upon reflection, it made a great deal of sense. It is not the person who has caused harm to his enemies who is most victorious, but rather the one who preserves both himself and his enemies from harm. It is not the person who crushes his enemy who has won the greatest victory, but rather the one who has gained his enemy as a friend. The true victory is not seeing an enemy's blood, but rather winning his heart. In the spiritual combat, we often make a similar mistake with regard to victory. We might think that victory in the spiritual life is to put an end to our own sufferings. We might think that victory is a matter of fighting our spiritual enemies and defeating them. We might think that spiritual success will lead us to worldly success as well. We might think that when we are able to perform great wonders and miracles in Christ's name, then we have reached the pinnacle of spiritual victory. And as Lorenzo Scupoli points out in The Spiritual Combat, we would be wrong. The second is a persistent application to the serious and diligent examination of every object in order to distinguish the good from the evil. A judgment is formed which is not in accord with external appearances, the testimony of our senses, or the standards of a corrupt world, but which is conformable to the judgment of the Holy Spirit. Then we shall clearly see that what the world pursues with such eagerness and affection is mere vanity and illusion; that ambition and pleasure are dreams which, once shattered, are succeeded by sorrow and regret; that ignominy is a subject of glory, and sufferings a source of joy; that nothing can be more noble or approach the Divine nature more closely than to forgive those who injure us, and to return good for evil. We shall see clearly that it is greater to despise the world than to have it at one's command; that it is infinitely preferable to submit to the humblest of men for God's sake, than to command kings and princes; that an humble knowledge of ourselves surpasses the deepest sciences; in short, that greater praise is due to him who curbs his passion on the most trivial occasions, than to him who conquers the strongest cities, defeats entire armies, or even works miracles and raises the dead to life. Victory in the spiritual combat is not to put an end to our own sufferings and poverty, but rather to embrace them for the sake of love. The final victory of the spiritual combat is not to fight our spiritual enemies, but rather to become so close to God by our love that the powers of darkness cannot fight us because we are protected by His radiant Light. The true victory of the spiritual combat is to humble ourselves, to let go of our selfish desires in order that our hands might be free to humbly accept God's gift of divine love, and to in turn give the gift of divine love to all who are made in His image and likeness. Note: This is the cover photo on my copy of The Spiritual Combat. Have you ever watched a mother comforting her child and seen it as immensely beautiful? Or a child hugging her father and telling him that she loves him? Perhaps a widow kissing a photo of her dead husband? Have you seen a couple holding hands and smiled because their love for one another was palpable? A soldier standing watch over his platoon? An older brother defending his younger brother from bullies? A granddaughter who visits her grandfather in the nursing home to laugh and talk with him each week? A friend who lets another friend stay at her home after their house burned down in a raging fire, treating them like family every day for months? No museum I've ever been to has art that moved my heart as much as witnessing these kinds of acts of love. No performance I've seen has shone with as much beauty as the human heart shines with the most beautiful love while performing acts of loving service. No "super models" who are plastered on the cover of magazines have ever even come close to entrancing me so deeply as entering into love itself in the daily life of many people. In my experience, there is nothing more beautiful than love. We know intuitively that beauty is inherently connected with love. We can see it in the way we decorate our homes, the extravagance of our love filling the space where our loved ones dwell with beauty in the form of art on the walls, well-made furniture, vibrant plants, portraits or photographs on the shelves and tables, and flowers in a vase. We can see it in how we give them gifts wrapped in paper with lovely patterns on it. We can see it in how we adorn those we love in precious jewelry, purchase delightful perfumes for them, and give them the best clothes we can afford. This is part of the beauty of love, that we choose to surround those we love with as much beauty as we can provide for them. So it is with building a beautiful church for the one we love above all, the one who loved us unto death. We decorate His house with art on the walls and the ceilings, furnish it with well-crafted chairs and pews, brighten it with vibrant plants, and place portraits of the Icons of Love on the shelves and tables. We present the gifts in the most precious metals of silver and gold, adorn His Word in the best binding we can afford, and fill His house with the finest fragrance of frankincense. We give Him the greatest treasures of worldly beauty we can afford. This we do for our beloved Christ, our God who gives us all, including the freedom to lose it all, and then gives us His all once more after we lose it. Giving Him all the best we have is not solely an act of love for His sake, but also an act of love for all. All can walk in the midst of the most wondrous beauty which fills His house, the house built with love for the one who is Love, each part of the building of the church a beautiful act of love, the beauty of love shining in every inch of the beauty made for Love Himself. All can witness the immense beauty of love in the church made with love. Each person who prays with love in the house of the Lord shows us the beauty of love. Each person who kisses the cross with love shows us the beauty of love. Each person who struggles to walk in on aching knees, kneels with aching back held straight, and sits with an aching heart full of love shows us the beauty of love. Each person who sacrifices for the sake of going forth to the house of Love to give back in love all that Love has given to them shows us the true beauty of love. With each gift of the beautiful to the One we love and the ones we love, we fill the world with a bit more love and beauty. We are called to fill this world to overflowing with the beauty of our love, shining forth as an icon of Love's beautiful heavenly home. We are called to make our lives and the lives of others more beautiful by our acts of love, showing to all the beauty of love in each moment of each day. We are called to love to death all those parts of us which do not reflect the divine radiance of the King who is the fulfillment of all that is true, good, and beautiful, thus burning away in the fires of love those parts of us which do not shine forth with the heavenly Beauty of Love. 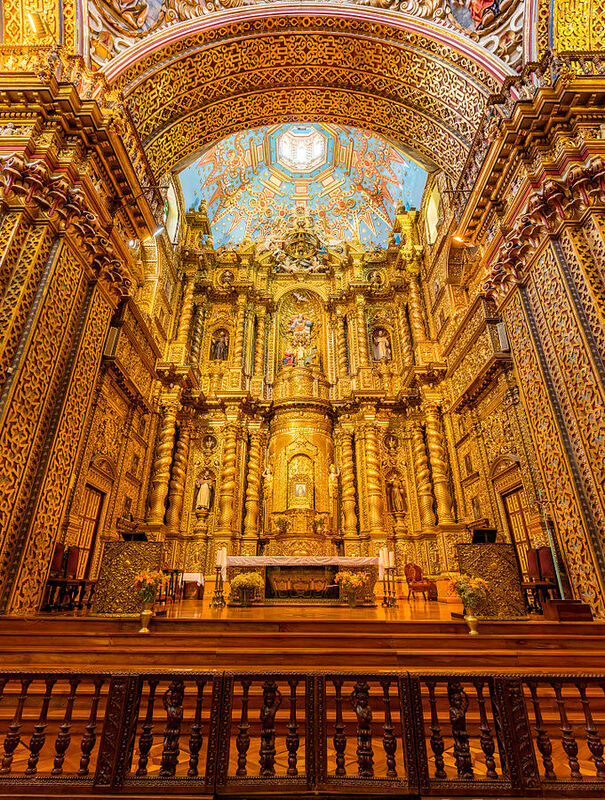 Note: The above is a picture of the Church of the Society of Jesus in Ecuador. Unfair Questions: What is your denomination? Tonight, I attended an event for fostering understanding between people of different beliefs. It was a panel discussion, and the panelists were members of the Church of Latter-Day Saints, a self-identified liberal Methodist church, and a member of a local Independent Baptist church. The discussion was polite and useful, and there were no surprises for me from the panelists. I was really hoping there would be some surprises for me, but unfortunately it wasn't from the designated speakers. A kindly retired gentleman in the row in front of me did ask a very interesting question, which is, "Have you studied any ways of interpreting the Bible that came before the 19th century?" Unsurprisingly, it turned out that none of them had. Not one of them could name Origen of Alexandria or Saint Jerome, for example (just as I wouldn't have been able to before my 20s). Not to mention any of the other early Christian thinkers who compiled, translated, or interpreted the Bible. I could tell that the gentleman in front of me was a bit disappointed when he asked the question twice and received non-answers both times. At the end of the panel discussion, I introduced myself to him and mentioned that I had actually read earlier Christian scholars of the Bible and talked about his work with a campus ministry group. At one point, he asked me, "What's your denomination?" I replied, "I don't have a denomination." That was the end of that discussion, and we bid each other a good evening. But those who know me might wonder why I would have told him that. After all, I do go to church regularly. And the church I attend has a name and clearly defined doctrines. I'm a Roman rite Catholic. So why do I not consider myself part of a denomination? I don't consider the Eastern Orthodox intercommunion, the Oriental Orthodox churches, or the Assyrian Church of the East to be denominations either, and for the same reason I don't consider the Catholic communion to be a denomination. The ecclesiology in light of which denominations make sense didn't exist before the Reformation; the ancient churches use a completely different frame of reference for understanding their relationships with one another. If I were to ask a post-Reformation Christian, "Under which Patriarch's jurisdiction are you?" they would probably have no idea what I was asking. They (and my younger self) would not understand the question because their ecclesiology doesn't function even partially based on patriarchates, apostolic sees, or popes. But if I ask my Eastern Orthodox, Oriental Orthodox, or Catholic friends, they have a frame of reference that allows them to answer the question. My Antiochian Orthodox friends can mention John X of Antioch, my Coptic Orthodox friends can mention Pope Tawadros II of Alexandria, and my Catholic friends can mention the Patriarch of the West, Pope Francis of Rome. Of course, I never ask a post-Reformation Christian, "Under which Patriarch's jurisdiction are you?" They don't have a Patriarch any more than I have a denomination. Nor do I ask a pre-Reformation Christian, "What's your denomination?" That would be the wrong question to ask, which is why I generally just ask, "What church do you go to?" when someone indicates that they are a church-going Christian. It has the benefit of politely revealing the information I seek while not assuming that everyone shares the same ecclesiology I do. I completely understand why someone who has no significant familiarity with any form of Christianity older than the 1600s would ask this question, because they really have no way of knowing why it's not a good question. I'm not offended when asked my denomination, but it is a good opportunity to discuss older forms of Christianity and their very different understanding of what it means to be part of the Church. Fair Questions: Are atheists immune from superstition? I've known a fair number of atheists and spent a lot of time in dialogue with atheists, and many of them take a very dim view of superstition just as I do. They often see the omens, astrology, routine prophecies of the end times, the wearing of charms, and so on as a misunderstanding of causality rooted in magical thinking and agency over-detection, just as I do. Given that most of them are scientific realists, their general rejection of the supernatural (not just the supernatural causality of superstition) seems to provide them with a means of resisting the tug of magical thinking and agency over-detection more often than others on average. At the very least, they are more likely to explicitly reject certain kinds of magical thinking and agency over-detection, especially those associated with religion, pseudo-science, and various "paranormal" claims. Though I'm deeply religious myself, I certainly see value in cultivating a resistance to superstition, including superstitious practices which inevitably tend to accrete around religions. Fortunately, having two parents educated in the hard sciences helped to form me in such a way that I have a well-internalized resistance to superstition of my own. That said, I can certainly fall prey to magical thinking and agency over-detection at times. I notice it occasionally, and there are probably times when I don't notice it as well. That's largely because these are normal human cognitive traits, thought patterns into which we fall quite easily because they were useful for our survival in times of harsh survival pressure under which quick and dirty heuristics are better than lengthy and less inaccurate methodologies for arriving at correct conclusions. Despite my intuitions, there is very good evidence that atheists aren't really any less prone to utilizing those quick and dirty heuristics (magical thinking and agency over-detection) than anyone else when the chips are down. Understandably, they are likely to resort to those heuristics under pressure just as anyone else is, their resistance to superstition decreasing the more dangerous it gets in the foxhole. It makes sense that our risk-management instincts kick in under pressure, so I certainly don't think anyone needs to feel shame for that. Given the way we evolved and the instincts (quick and dirty as they are) propelling us to make decisions under pressure, we should expect ourselves to fall prey to magical thinking and agency over-detection because that's just what our brains do as naturally as they do anything else. But what it means for us is that we all have to be constantly vigilant against our own cognitive errors and not rely on the luxury of explicit reasoning which might give us the impression that we are immune from the vagaries of our highly evolved brains, brains which are evolved primarily for survival and perhaps have philosophical musing as a latent function. You can listen to the embedded podcast version of this 3-part series or read the written version below. I noticed many weaknesses in myself today. Sore knees, rough feet, a bad attitude at times, and less prayer than I ought to do. I didn't always notice my weaknesses. When we are children, we often suffer from the illusion of invincibility if nothing teaches us over and over that we have many weaknesses, that we are fragile creatures. A great setting in which to acquire that teaching is in martial arts training. Even with all the stubbornness and pathological independence I brought to my teenage years, I was not able to maintain the illusion of invincibility after losing matches to men in their 60s who were faster and stronger than I was. Getting punched in the face (by a man to whom my 6' 205lb self was giving several inches of height and a hundred pounds in weight) and seeing stars fill my vision as my skull was compressed by the force was an unavoidable lesson in my weaknesses in the face of a larger opponent. My instructor, in his wisdom, had arranged for me to spar with many different opponents, to suffer from many different attacks so that I could learn my own weaknesses and learn to defend myself from the attacks. He didn't do this to be cruel, but rather to help me to be transformed into an effective fighter who could train others in combat and defend others who were being attacked. He was helping me to learn the lessons needed to survive and thrive so that I might help others survive and thrive. He was helping me to unlearn my youthful pride, the pride that is deadly in combat against any or many opponents who may be faster or stronger than we are. This pride that is often deadly in physical combat is also deadly in the spiritual combat, the fight to unite ourselves with divine love. We need a teacher who can help us to overturn our deadly pride and learn our weaknesses, as Lorenzo Scupoli explains in The Spiritual Combat. "If God Himself, in order to open their eyes and to show them the true path of perfection, should send them crosses, sickness, or severe persecutions, the surest trials of His servant's fidelity, which never happen unless by his plan and permission, then the degenerate condition of their hearts is laid bare through their own extravagant pride. In all the events of this life, whether happy or not, they know nothing of a proper conformity to the Will of God. They do not know how to yield to His almighty power, to submit to His judgments which are as just as they are secret and impenetrable. They do not know how to imitate Christ Crucified, as He humbled Himself before all men; nor do they know how to love their enemies as the instruments used by God's goodness to train them to self-denial and to help not only in their future salvation, but in greater sanctification of their daily life. This is the very reason why they are in imminent danger of being lost. With eyes blinded by self-love, they examine themselves and their actions which are not otherwise blameworthy, and they are inflated with vanity. They conclude that they are far advanced towards God and they readily look down on their neighbor: in fact, their pride often will so increase their blindness, that their conversion cannot be effected without a miracle of grace. Experience proves that acknowledged sinners are reformed with less difficulty than those who wilfully hide themselves under the cloak of a false virtue. From this you can easily understand that the spiritual life does not consist in the practice enumerated above, if they are considered only in their outward appearance." In the spiritual combat, our teacher is God Himself, the Saints are students who are advanced, and we are generally the beginners. Just as my martial arts instructor helped me to find my weaknesses so that I could grow in strength and learn effective physical combat, God helps us to find our weaknesses so that we can grow in love and learn effective spiritual combat. When I was younger, I thought that God was being cruel, sending me struggles just to watch me squirm. But now I have learned that he is the eternal teacher; He was helping me to learn the lessons needed to overcome my reliance on my own strength while ignoring my own weaknesses. In those moments when I find myself facing off against a strong temptation which is much larger than my self-control, I know that this is part of training in the spiritual combat, that it is teaching me my weaknesses so that I do not fall prey to pride and helping me to learn how to fight for the sake of love. He is teaching me so that I can grow strong, able to help others who are fighting their own battles in the spiritual combat, so that we can fight together and die to sin together and rise to new life in Love together. I, like most people, first began to learn about love from my family. I learned about love from my mother's tenderness, from her generosity, from the myriad sacrifices she made so that we her children might live more fully. And I learned about love from my adoptive father, who was truly a father in showing me that life requires discipline, constant learning, and a strength used to lift up those who cannot lift themselves up. I learned about love from my maternal grandfather, who showed me the great humility of love, and from my maternal grandmother, who showed me that love wields the sword of truth and also that it brings us our daily bread despite our ingratitude. I learned about love from my paternal grandfather, who showed me that love was a matter of commitment, that love transcended mere affections, though it certainly included them. I learned about love from my paternal grandmother, who showed me that to love God is to love His Church and all those made in His image as gently as He did. I learned about love from my brother, who would give his cloak and his last morsel to eat to one who had none without a regret, and from my sister, whose passionate loyalty to those she loves is inspiring to me. And I learned about love from my adoptive brothers and sisters, who welcomed me into their lives though our blood was not the same, showing me that familial love is not a matter of mere genetic kinship, that the love of a family is far bigger than a blood vessel. I learned about love from my cousins who treated me like a brother, and from my friends who became, despite the lack of close blood ties, my brothers and sisters by the ties of love. Though we may have hurt each other many times, love always brings us back together. No matter how much blood has been spilled from pierced or broken hearts, love prevails in the family so long as we do not cast ourselves out of it and choose to live outside those bonds of love. And just as love prevails in the human family, so too does love prevail in the divine family for those who love the Father and the Son, not casting themselves out of the bonds of the divine love by becoming slaves to the transient pleasures of the flesh. And just as my experience of love began in the experience of the family, the family is also where Jesus the Christ entered fully into human love as He had already entered fully into divine love as the only-begotten Son of the Father. In the Christian cosmology of love, God who is Love is also a family of persons, though one in essence. Just as the human person is an imago dei, made in the image and likeness of God, so too is the human family made in the image and likeness of God who is the divine family of Love Himself. Christ is the living Icon of Love, we human persons are Icons of Love, and the family that is full of love for all its members is also an icon of Love who is in Himself the Family of Love. 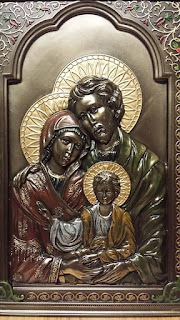 The Holy Family into which the Son of God was born of the virgin Mary is the Icon of the Family of Love, the divine family into which can be adopted as sons and daughters of the Father, brothers and sisters in the Blood of Christ which in which we all share. The Blood of Christ, shed for us on the cross, is how we are all members of the Body of Christ, the Church which is the family of Love Himself here on the earth, the family which is also triumphant in Heaven. By the humility of Love, He who became flesh of our flesh and bone of our bone in order to conquer the death to which we all are subject and invite us into the divine household to become subjects of Love, Christ our God and King was born into the Holy Family of love, born into the world by Mary, the Mother of God and Queen of Heaven. By birth and by adoption, Christ was made a member of the Holy Family; just as Joseph was the adoptive father of Christ, so too is God our adoptive Father through Christ who became our brother in His Blood. Christ shows us by His life that we enter into the family of love by both birth and adoption, that both the bonds of His Blood poured out for us and the bonds of His love which is unto death allow us to enter into the eternal life of divine love in the Family of Love. Christ shows us by his death on the cross, bearing the weight of the sins of the world, that we enter into the Family of Love in Heaven after we suffer for the sake of love and die to our sins which separate us from Love. By Christ's example, we are called to live life in full communion with the family of love into which we are born, and in full communion with the family of love into which we are adopted, and in the hope of full communion with the Family of Love in the heavenly household. We are called to love to death each part of us that cannot partake of divine love by loving our family by blood, loving our family by adoption, and loving our triumphant heavenly family even unto the death of our sins. We are called to let the love of that great family, Christ and the Church who is His Bride, sanctify us and make us holy members of the Church, of our adopted families, and our families by blood by serving them as Christ has served us, the service of great selfless sacrifice rendered for the sake of the beloved. By the power of love, we are forever able to exist in the embrace of love, held always in the arms of a family entered into by blood, the arms of a family entered into by loving adoption, and held eternally in the arms of the Father in the heavenly home of the Family of Love. Note: Photo credit goes to me. The picture above is of an icon of the Holy Family (Jesus, Mary, and Joseph). Today, I fell. It wasn't the first time, and it probably won't be the last. One of the most valuable lessons I ever learned from my martial arts training was the lesson on how to fall. Whether falling because of a punch, a kick, or a reaping throw, it's important to avoid compounding the injury by falling in such a way that one aggravates the injury further or causes an additional injury. In combat, particularly combat in earnest in which one's life is in danger, a poorly-managed fall might be a personally eschatological event: The End. It is always better to fall in such a way that one ends up in a position to recover, facing one's opponent and being ready to continue the fight; it is best not to give up the fight for one's life prematurely. And this is easy to do; battle-weariness can set in relatively quickly, especially without undergoing the training necessary to acclimatize to extended combat in both the toll it takes on our musculature and the toll it takes on our mind as we reel from being in crisis mode and the rush of adrenaline. The longer our fight, the more tempting it becomes to see the battle as a futile exercise that we cannot win, to lose hope and let ourselves be destroyed by the one would take us to the end of our story. It becomes difficult to see how the author might write a happy ending to our story, so why not resign ourselves to the catastrophic and tragic end? Why not lie down, exhausted from the combat, after fighting for a time? This same malaise that can get us killed, our physical bodies ruined and tossed in the dirt, very much afflicts the spirit as well. It is tempting to see the spiritual combat as a futile exercise, a battle that we cannot hope to win, and let ourselves be destroyed by our adversary. When we fall in the spiritual combat, we so often do not fall very well; we fall in such a way that we will aggravate our existing spiritual weaknesses and even cause new spiritual wounds to be opened. So we need someone to teach us how to fall. Lorenzo Scupoli has a valuable lesson on falling in The Spiritual Combat, a spiritual classic in both Western and Eastern Christianity. "The presumptuous man is convinced that he has acquired a distrust of himself and confidence in God, but his mistake is never more apparent than when some fault is committed. For, if he yields to anger and despairs of advancing in the way of virtue, it is evident that he has placed his confidence in himself and not in God. The greater the anxiety and despondence, the greater is the certainty of his guilt. The man who has a deep distrust of himself and places great confidence in God is not at all surprised if he commits a fault. He does not abandon himself to confused despair; he correctly attributes what has happened to his own weakness and lack of confidence in God. Thus he learns to distrust himself more, and he places all his hopes in the assistance of the Almighty. He detests beyond all things the sin into which he has fallen; he condemns the passion or criminal habit that occasioned his fall; he conceives a deep sorrow for his offense against God. But his sorrow, accompanied by peace of mind, does not interrupt the method he has laid down, nor does it prevent the pursuit of his enemies to their final destruction." It is natural to feel sorrow when we fall, because it strikes at our sense of self-confidence, but Scupoli advises us that the right way to deal with a fall is to both feel the sorrow and peace of mind as we fall. He points out that we should expect to fall, knowing that our limitations and weaknesses make us prone to it, and this is true physically as well as spiritually. We are indeed fragile creatures who can be pushed over easily or lose our balance on our own without any prodding. And just as peace of mind is important to surviving a spiritual fall and continuing the fight, I've learned that peace of mind is important for doing the same in a physical fall. It seems counter-intuitive given our instincts, but the best thing to do when falling is to relax. This reduces the likelihood of injury and mitigates the damage done by injuries which do occur because rather than being brittle when we hit the ground, we can roll with it and transfer the force so that our bodies are not absorbing the entire impact. And in the same way, peace of mind is important when falling in the spiritual combat; it reduces the damage done to us because when we fall trusting in God to catch us, He absorbs some of the impact and we do not have to absorb the full impact of our falls so that it wounds us severely. In the same way that we trust that the earth will be there to catch us when we fall physically (though it will hurt when we are caught), we must learn to trust that God will be there to catch us when we fall spiritually. Though it will likely hurt when we fall upon the Rock of Love, our insecurities shattering upon impact, we will survive and be better for the fall. Learning how to fall is not merely a matter of self-protection, but also a matter of development; falling well is a habit which will serve us well in the spiritual combat we all face as we seek the light of His face in the Beatific Vision.